Yes, children from the age of 12 can have intraMAX. Is intraMAX recommended for cancer patients? We do have practitioners who recommend intraMAX for their patients with cancer. We recommend that cancer patients speak to their own health care practitioner to see if intraMAX would be beneficial for them, as well as when to take during the course of treatments. Drucker Lab’s intraLINE products are created using a proprietary carbon-bonding process called intraCELL Technology. This technology allows living carbon to bind to nutrients within each product in order to provide a faster, more efficient absorption rate. Though science plays a major role in our products, nothing replaces the necessity of nature. That is why our core ingredients come from whole food sources such as fruits, vegetables, and herbs. The result is complete liquid nutrition all-in-one 30 ml. Our all-in-one dietary supplements, intraMAX® and intraKID®, are not considered vegan because both products contain bee pollen, bee propolis, and royal jelly. These ingredients are naturally-derived byproducts of bees. However, our trace mineral supplements, intraMIN® Tropical Fruit and intraMIN Unflavored, are vegan products. No. Heavy metals in our products are well below the daily limits established by the FDA . Drucker Labs tests every lot to ensure that these standards are met prior to your product being released for distribution. Can I take both intraMAX & intraMIN at the same time? There is no danger in taking both intraMAX and intraMIN because the amounts of the minerals in the two product dosages are not in excessive quantities – not close to the established daily dietary limits. How should I interpret the expiry date? The date format on the product is based on American date as it is produced and bottled in the US. So the format will be MMDDYY. How tall is a 946ml intraMAX bottle? 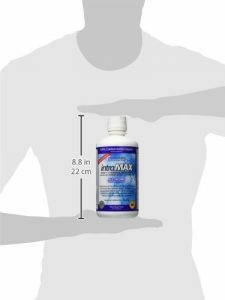 The height of a 946ml intraMAX bottle is 22 cm or 8.8 inches.